Never take education for granted: See Daniel Cabrera inspiring us here. 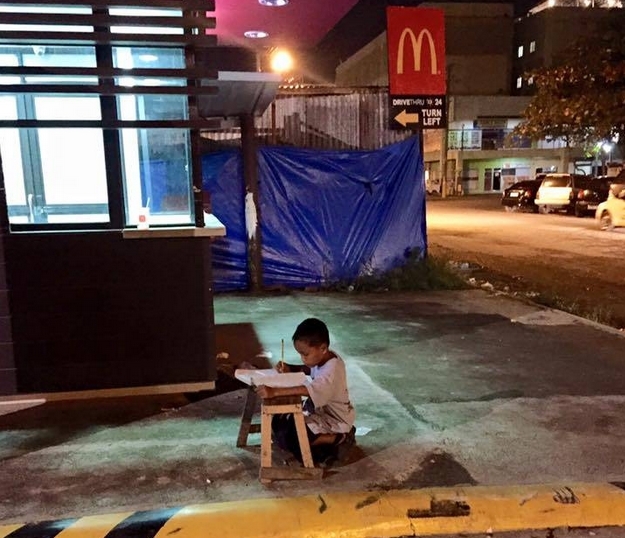 This nine year old Daniel Cabrera, young homeless boy from the Philippines, Mandaue City has something to teach us. This picture was taken by Joyce Torrefranca and posted on Facebook recently, she said she was inspired by the child. In another post, Joyce added: "I hope Daniel's story will continue touching our hearts so that we will always be inspired and motivated in every situation we face in life." Daniel's mother said: "He goes to McDonald's to study because there is no electricity in the food stall." His mother, Christina Espinosa, and younger brother, Gabriel, live inside a tiny stall where Mrs Espinosa sells street food.